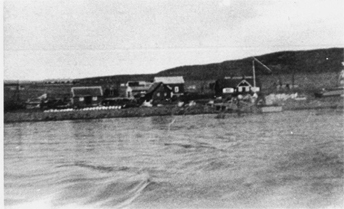 "Nanook 50" was the operational code word for the resupply runs to Thule, Greenland and Resolute, Cornwallis Island, Canada. These supply runs took place in the summer months ( late June through August ) in the years 1947, 48, 49, and 50. In 1951 a secret operation code named "Blue Jay" replaced the Nanook operations. This operation now declassified brought together a massive supply and construction operation to build what is now Thule Air Base. 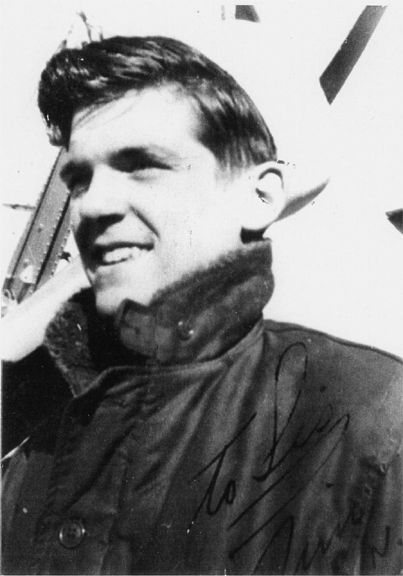 I [Jim Stoltenberg] was involved in the Nanook 50 operation when I was a fireman 1st class with duty station in the engine room of the USS Whitley. In April of 1950 the ship was informed that it would be taking the place of our sister ship, the USS Wyandot KA-92. for the resupply run to the Arctic bases. 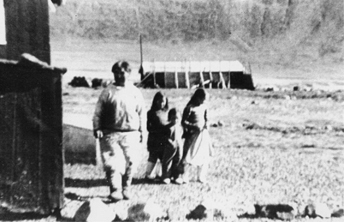 The American government maintained a weather, radio and a DEW line station and airstrip at Thule. 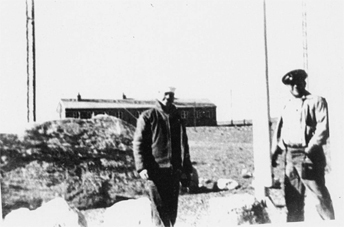 Resolute was a joint Canadian and U S weather , radio and DEW line station. The Canadians also maintained an air strip there. My ship the USS Whitley AKA-91, a WWII amphibious cargo assault ship that had been damaged severely enough in the assault and invasion of Iwo Jima to keep her out of further action had been reassigned to the Atlantic Command following the end of WW II. Her normal operational runs were supplying our many bases in the Caribbean including Panama with an occasional voyage to the European and the Mediterainian bases. North Star Bay [Thule Air Base] is about 3500 sailing miles from Boston, MA. and is usually clear of ice by the first of July so that shipping can enter and service Thule. The same being true for Resolute. 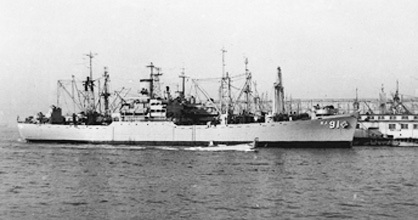 The Whitley departed the Charlestown Navy Yard on July 12, 1950 bound for Halifax, Nova Scotia. 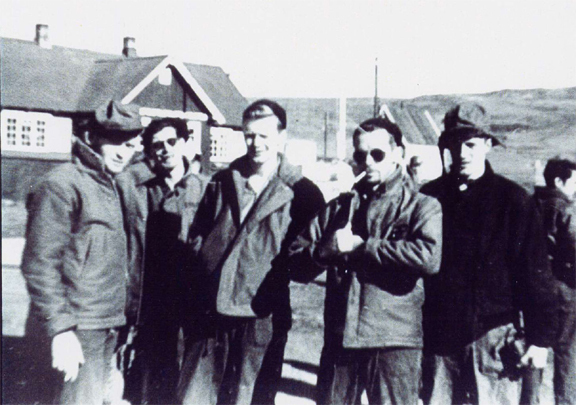 On board in addition to the regular naval personnel are civilian replacements for the radio and weather stations and military personnel to releave the DEW line staff. They will replace the men left there last year. We entered the harbor at Halifax on the 14 of July, embarked Royal Canadian Air Force personnel and their equipment to be transported to Resolute. 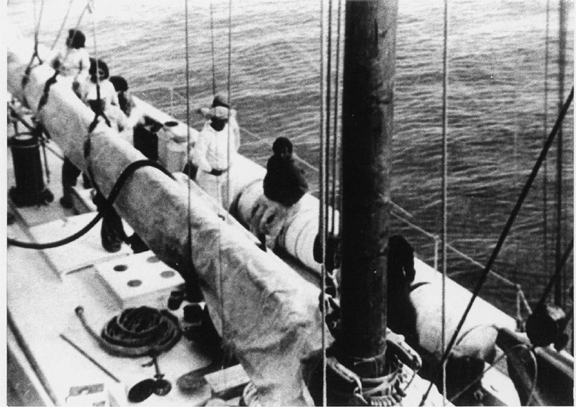 On the 17th of July we departed Halifax and sailed through the Grand Banks of Newfoundland and headed North through the Labrador Sea and into the Davis Strait and at 0141 on July 20, 1950 we crossed the Arctic Circle and enter the Northern Domain of the Polar Bear and the crew will henceforth be known as " Blue Noses". 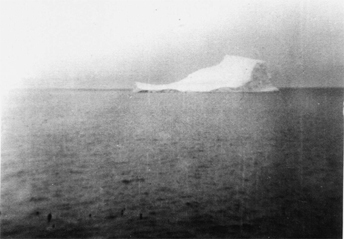 We start to encounter many large icebergs; they are wondrous things to see like large white islands, only moving, drifting slowly south. We enter Baffin Bay and meet up with our escorts, the Navy icebreaker Edisto and the Coast Guard breaker East Wind. This is there normal duty station keeping track off the icebergs and clearing harbors. They will give us assistance if needed. 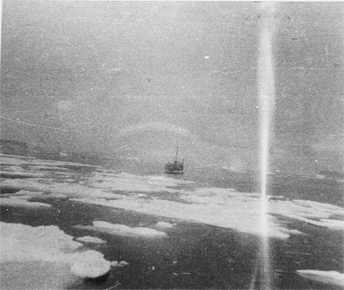 As we proceed north, we are told that The LST 533, who is some distance ahead of us, has run into heavy pack ice and is forced to turn around. Later in the day we will pass her as she heads south to meet up with the icebreakers. The weather is cold and it is daylight 24 hrs now. The early morning hours are usually heavy fog and the going is slow and we thread our way through the icebergs. The fog usually lifts by 1000 hours and the rest of the "day" is clear and sunny. On July 23 we reach the ice pack and it is to heavy for us to penetrate so we will wait for the icebreakers. We are lying to and are 220 miles south of Thule and 80 miles NW of Uppernavrik, Greenland, last easily reached port of call for Arctic travelers. On 24 July 1950 the icebreakers arrive along with the LST 533 and begin to clear a path and we are underway, the LST 533 following. On July 25 at 2250 hrs we drop anchor in North Star Bay, off the village of Thule. It is cold and lonely looking. We immediately lower our landing craft into the water, strip all the hatches, and commence to unload. Time is of the essence and we work 8 hrs. on and 8 hrs. off. The work is hard, as every thing has to be man handled. 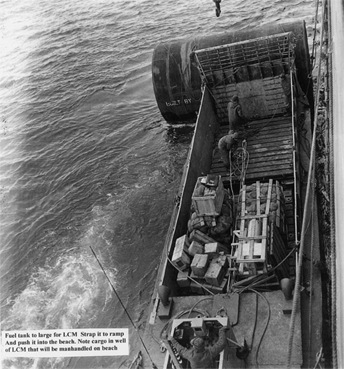 The small boats take the cargo to the beach were it is unloaded by hand and stacked: 55 gal. drums of aviation gas, fuel oil, and kerosene. Coal, foodstuffs, spare parts, you name it. The mess hall is open 24 hrs as every one eats or sleeps when he can get a chance, but we do find time for a few base ball games. As usual sailors have to barter with the natives, trading cigarettes for trinkets carved out of Ivory, later exposed to be dog bones. The local Inuits, of which there are quite a few, exist by hunting and fishing and whatever the Danish Government can give them. A few are said to have been with Knud Rasmussen, the noted Arctic Explorer on his expeditions in the early part of the century and one with Perry on his trip to the North Pole. Their village and way of life is like something out of the National Geographic. 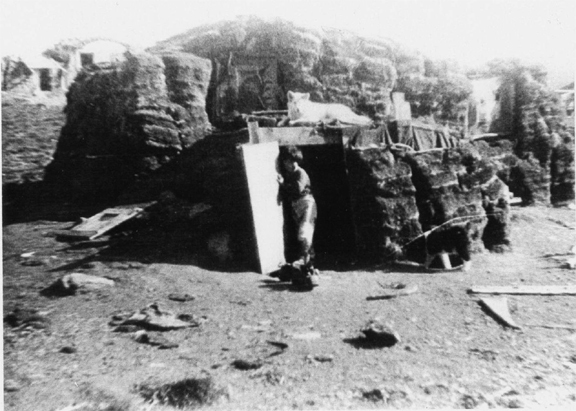 They live in sod huts and their transportation are their dogs and sleds. Except for a few " modern conveniences", such as kerosene lamps, they live as their ancestors have for hundreds of years. What took experienced stevedores two months to load aboard the Whitley we do in 21 days by hand. "Fuel tank to large for LCM Strap it to ramp And push it into the beach. 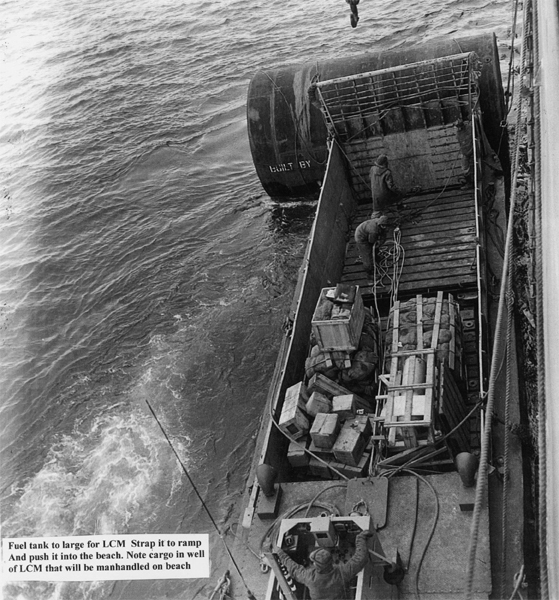 Note cargo in well of LCM that will be manhandled on beach"
On the 15th of August we depart Thule and North Star Bay and are underway for Resolute. 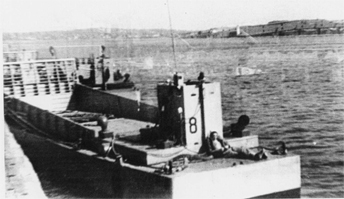 The Edisto and the LST 533 also depart. The 533 is heading home, the Edisto back to her iceberg patrol. We steer a southwesterly coarse and enter Lancaster Sound then the Barrow Strait and on August 17 The Whitley anchors in Resolute Bay, Cornwallis Island, Queen Elizabeth Islands. We immediately commence to unload our cargo and debark out passengers. We will have to work hard and fast in order to beat the ice that will surely come and close off the Bay. August 19 ice is starting to creep in the small bay and we finish unloading and embark our passengers, hoist our boats aboard, and begin making preparations for getting underway. August 20 early morning hours we weigh anchor and get underway slowly threading our way through the ice which has become heavier and head for open water enters the Barrow Strait and Lancaster Sound and into Baffin Bay. The Whitley turns south and heads for home. On August 31 the Whitley arrives back at Boston, her Arctic venture is over. No one aboard had any inkling that ours was to be the last " Nanook" operation. 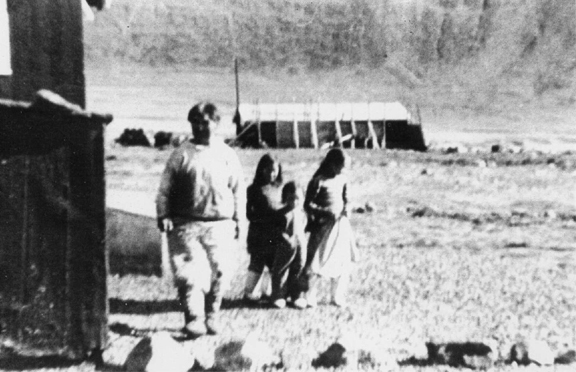 Danish settlement near Thule village. 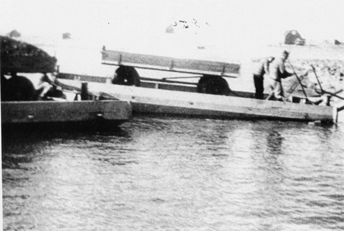 Native flat bottom skiffs and 4 wheeled cargo carts used to unload cargo from ships anchored in bay. Sailboat owned by Artic Explorer Mc Donald along side the Whitley for fuel and supplies. 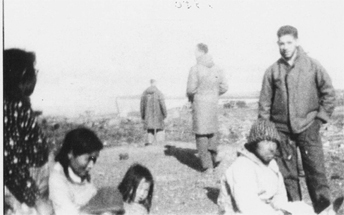 Crew of native Inuits and American college students. James Webster Stoltenberg 76, passed away Wednesday, May 16, 2007. He was born Feb. 23, 1931, in Chicago, to Webster and Alice Stoltenberg. He is survived by his wife of 53 years, Shirley; sons, Jim Jr., Eric, Ronald and Kenneth; 10 grandchildren; four sisters; and one brother. A memorial service will be held June 30 in Scottsdale, Ariz. James, a Navy veteran, will have his remains committed to the sea. In lieu of flowers you can make a donation to pearlharbormemorial.com.